This is like the kid brother of the classic brunch dish. We mean that in the best way possible: We love the tasty waffle stack like family! Fill a medium pot with 2 inches of water. Add vinegar, and bring to a boil. Meanwhile, toast waffle, and top with ham. To make the sauce, in a small microwave-safe bowl, combine yogurt, mayo, Dijonnaise, butter, and lemon juice. Mix until uniform. Once water is boiling, lower temperature until a steady simmer is reached. Crack egg into a small shallow bowl. Give water a stir, and gently add egg. Cook until egg white is mostly opaque, about 3 minutes. Using a slotted spoon, carefully transfer egg to a layer of paper towels to absorb excess water. 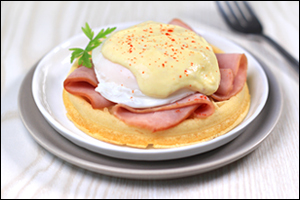 Transfer egg to the ham-topped waffle. Microwave sauce for 15 seconds, or until hot, and stir. (If you prefer a thinner sauce, add a bit of water). Spoon over egg, and dig in!